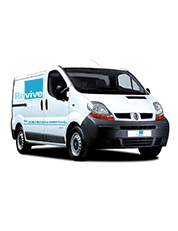 Revive Carpet Cleaning is a small family run business in Weston-super-Mare that offers a real value for money service, when it comes to carpet and upholstery cleaning. 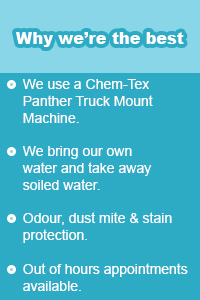 We use a Chem-Tex Panther 25hp truck mount machine. We bring our own water and take away dirty soiled water, all our cleaning solutions are safe to use on all carpet & upholstery fibres and there is no extra charge for out of hours appointments. All our staff attend regular training courses and are fully insured when in your home or commercial premises. Revive Carpet Cleaning Services if you have a property or business in Somerset or the surrounding areas, then you know keeping the floors in your building or establishment in perfect order is just the cost of staying profitable. Commercial carpet cleaning can be overlooked or not performed often enough because many owners feel they can stretch an extra penny, out of waiting an extra couple of months. This line of financial reasoning is disastrous on so many levels, as it will actually cost more money in lost revenue, than most will ever realise. Keeping an above average look and feel to your business is not only good in keeping customers coming back, but also maintaining a clean and enjoyable atmosphere for you and your employees. We offer great carpet & upholstery cleaning including: Stain Removal & Protection, Odour Removal & Control, Infection Control, Hard Surface Cleaning. You may have purchased the top of the line in commercial grade carpet, specially made for your leisure facility, you are still going to have to stay on top of its maintenance. Food and beverage odours embed themselves deep into the fibres and possibly the backing, when they go without treatment and cleaning for months or even years. We also clean residential/domestic carpets & upholstery, from single rooms to whole houses. Specialising in pre inventory and end of tenancy cleans for rental properties - odour removal and infection control in nursery's, nursing homes and clinics. No matter how bad you may think your carpet is, avoid replacement costs. call Revive Carpet Cleaning today for a free no obligation quote. - You'll be amazed at the difference and the dramatic improvement in making your carpet & upholstery look and smell clean again.